To start the day …. 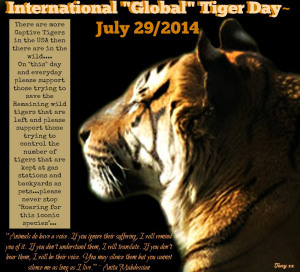 International “Global” Tiger Day”!! 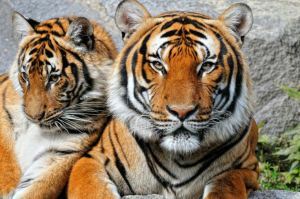 The most gorgeous of all mammals, anyone killing a tiger is less than human. 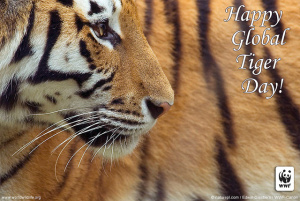 Happy Tiger Day! The world is losing its Great Cats at a vicious speed. If we lose our apex predators, then we lose a vital part of this Earth. 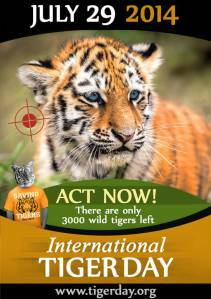 This page was created to help bring awareness and to be a voice for our Great-Big Cat Species. We must come together to help put a stop to this “Out of Control War” to kill our great cats, before it is too late. Once they are gone – there is no coming back. Thank you for this reblog, Jessie …. hugs! !